The Windham Eagle Entertainment: Netflix movie review: "Lion"
I enjoy most every movie I see, but it takes an amazing film before I believe it to be Oscar-worthy. But I can say without a doubt that “Lion” is deserving of such high honors. 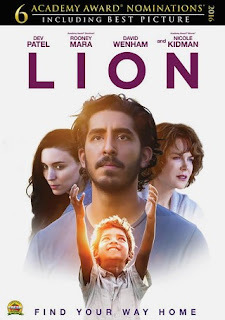 Available on Netflix, DVD and Blu-ray, “Lion” is an inspiring and true story about a five-year-old boy from India, named Saroo (Sunny Pawar) who gets lost on a train. He ends up thousands of miles away from his home and family, arriving in Kolkata where he doesn’t speak the local Bengali language. There he must learn to survive alone on the streets. Saroo eventually ends up in an orphanage and is adopted by an Australian couple, John (David Wenham) and Sue Brierley (Nicole Kidman). They provide a warm and loving home in Tanzania. Twenty-five years later, the older Saroo (Dev Patel) joins friends one evening as they eat Indian food together. It’s there he sees jalebi, a Indian delicacy he remembers from his childhood and the memories come flooding back. With dogged determination, Saroo spends almost every waking hour in search of his biological family and eventually finds them with the then new technology, Google Earth. With his adoptive parents’ support, Saroo sets out to find his lost family and finally returns to his first home – and reunites with his biological mother and meets his sister. It is impossible not to be moved by “Lion” and the great performances of all the actors – but special recognition should go to Kidman and Patel for playing their roles realistically and with excellence. The film is both heart wrenchingly sad and yet so superbly beautiful that it has landed on my list of all-time favorites. A fun interesting note about the name of the film. Once Saroo visits his biological family, he discovered that he had been mispronouncing his own name, which was actually Sheru, meaning "lion" in his native language. “Lion” is definitely a must-see!